Yesterday, Patrice and I got my 1948 Speed Liner flipped so I could remove the hull bottom. 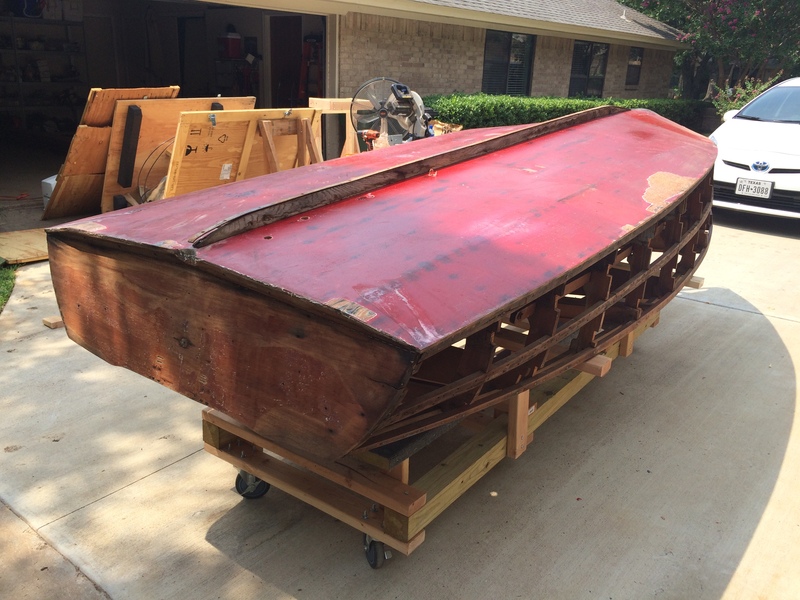 I had understood from the seller that his dad, who was the original owner of this boat, had fiberglassed both the hull bottom and the hull sides. Certainly, he did the hull sides. 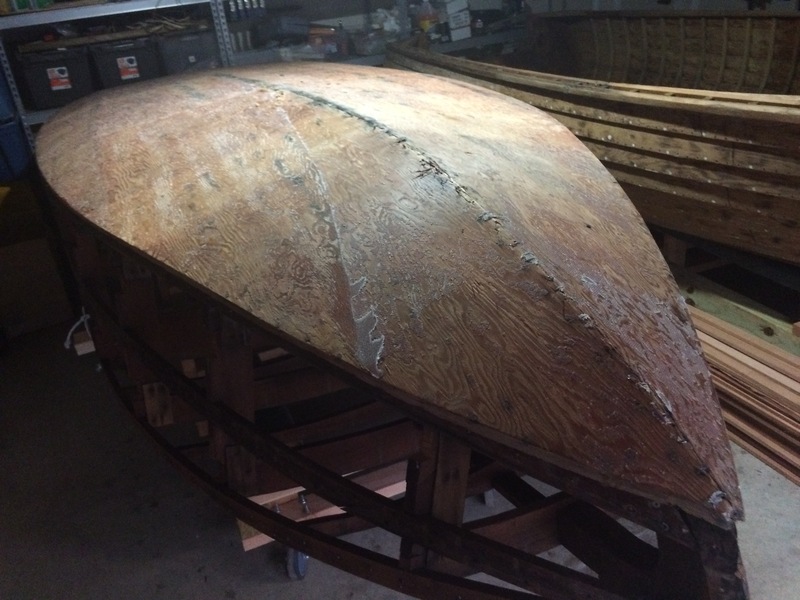 However, as I removed the fiberglass from the hull bottom, it became clear that the plywood bottom had always been covered in fiberglass, as evidenced by the fact that there was no bottom paint on the wood, but only on the fiberglass. Today I embarked on removing all the fiberglass from the hull bottom in preparation for replacing the plywood bottom with new wood. Working with fiberglass is not a pleasant thing. While it may be fun to rip it off in long strips like a bad sunburn, having bazillions of fibers stuck in your forearms is not fun at all. In fact, it is downright uncomfortable. 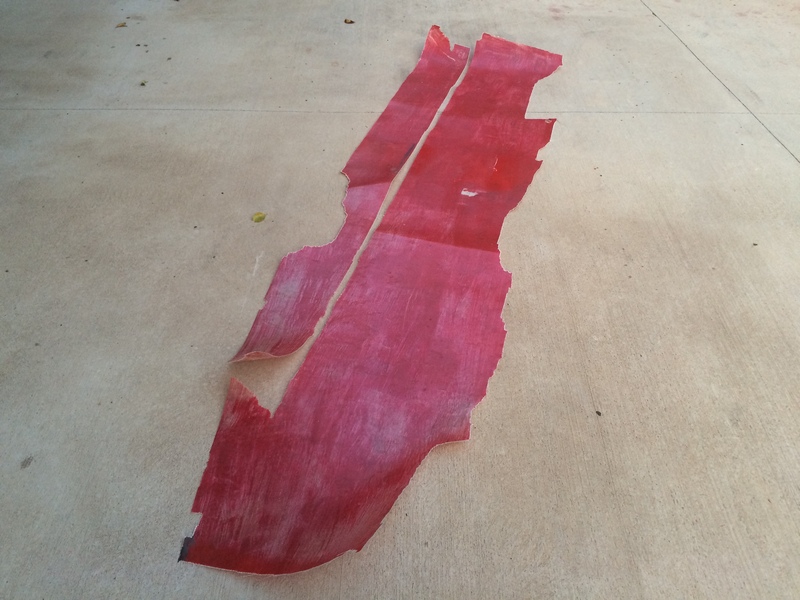 The fiberglass from the starboard side came off fairly easily until I got to the area of the keel. I had to remove the protective metal strips that covered the keel. The old and very long screws were pretty happy to stay right where they were and not at all happy about being removed. After much teeth gnashing and foul language, I managed to wrestle all the screws out and remove the keel in its entirety. The keel on this boat is not really the backbone to which all the frames are attached, as you might ordinarily think of a traditional keel. Rather, it is more of a long skeg that extends about two-thirds of the length of the boat. Once I got all the fiberglass off the starboard side and the keel off, the port side fiberglass come off in only two long strips that ran virtually the entire length of the boat! I was able to remove all the fiberglass from the hull bottom in only one work session. Of course, it is still covered over with fiberglass resin. Now that I have it stripped, I will have to go in search of the screws that I need to remove to get the actual plywood off. I expect that about 20% of those screws will come out in a cooperative manner. The rest require full combat. Fun stuff!